Chairs are shipped with braces attached accross the legs to protect them from damage during transit, please remove the brace with a screw-driver before using. The Clam Chair has been our signature product for over 30 years! Orignialy designed by Ceasar Sherrard (founder of The Orange Gallery) over 30 years ago, these chairs are now hand-crafted from the finest Honduran Mahogany by Belizean artisans. The Clam Chair is the most comfortable bare chair you will ever sit in. The ergonomic straight back, contoured seat design and low center-of-gravity provide superb support and relief for your spine. 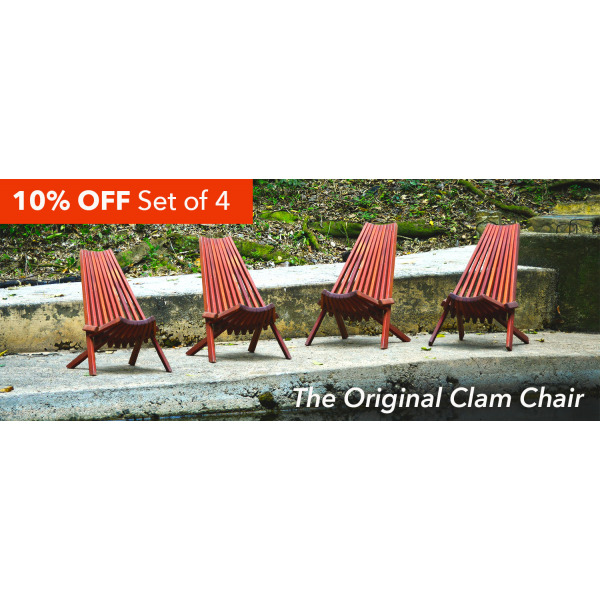 Built to last a lifetime, Clam Chairs have a natural oil finish and can be used both indoors and outdoors on your patio lawn, lanai or deck. Clam Chairs fold flat for easy transport and storage. Want to take your chair to the beach? No problem, just fold it up and toss it in the trunk. Need to store them during winter? 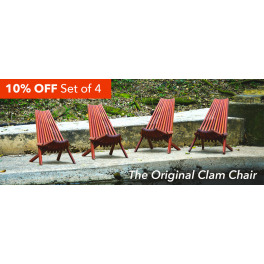 No problem, your Clam Chair will fold up and fit right in the back of the broom closet. 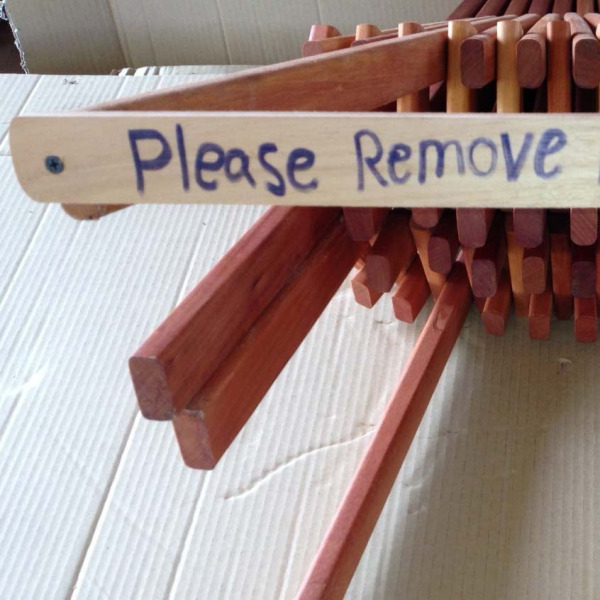 COLOR & AGING: Depending upon when the mahogany was milled, your chair may still be a bit “blond” upon arrival. 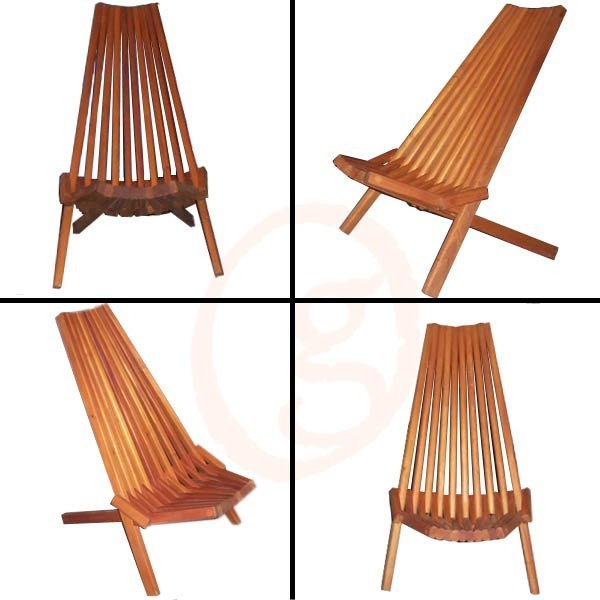 But with time the wood will oxidize and turn the classic dark red of “aged mahogany.” To encourage the color-aging process, apply a thin of oil to your chair and put in the sun for a few hours. If the chair is to reside indoors, or in the shade outdoors, it should be oiled about every 6 months. However, if the chair is to live outdoors in direct sunlight, be aware that it will eventually turn to a sun-bleached “barn-wood” silvery-grey.